First, thank you for being on the show! To create the Ask Different Podcast, the hosts and guests are connected to each other through a Skype voice conference call. Each participant in the call must also record their own audio and submit the recording file to the editor at the conclusion of the show. This document is intended to provide guests of the Ask Different Podcast with all the information they need to create a great recording. If you have a setup that works for you, feel free to skip the Microphone, Headphones, and Preparing sections. Don’t use the built-in microphone in your Mac. Built-in microphones universally produce bad audio and pick up lots of echoes and noise. If you can help it, don’t use the microphone in your iPhone headphones. While the audio is better than the audio from built-in microphones, it’s far from great and the microphone module likes to rub against your face and/or shirt during recording, producing undesirable noise. Some headsets leak audio. See the section on headphones to find out what it is and how to test for it. My old Logitech headset that I used for the first few episodes of this podcast developed a problem where the plastic would move slightly during use, sending a clicking sound down to the microphone. To determine if your headset clicks, I suggest recording your input while you talk and move your head around. Playing back the audio will reveal if your headset suffers from the same problem. On the whole, however, headset microphones tend to be mostly good. Dan Benjamin recommends the Logitech ClearChat Comfort ($29) and guests on the Stack Exchange podcast all use the Plantronics Audio 655 ($30). Standalone microphones are also mostly good. Standalone mics have the benefit that you can lean or turn away from the microphone if you need to breathe or cough. My co-hosts and I use the Blue Snowball ($60) and we get great sound from it. A USB connection is also greatly preferred, as they typically have better preamps than the built-in sound card in most computers. If you’re not using a headset, you’ll also need to think about headphones. There is really only one thing to keep in mind: audio leakage. This is when the audio coming out of your headphones is picked up by your microphone and can be heard on the recording. To find out if your headphones leak, I suggest playing relatively loud music through your headphones while you’re wearing them and recording the audio from your microphone (see recording section for instructions on how to record). If you can hear the music when the recording is played back, your headphones leak. If at all possible, avoid using headphones that leak. If it’s unavoidable, keep the volume during the call down as low as possible to minimize the leakage. I personally use a pair of Apple In-Ear Headphones ($79). Unlike regular iPod or iPhone headphones, the in-ear headphones create a sealed chamber inside my ear that does not leak any audio. They’re not cheap, but they can be used for more than just recording – for me, they’re my only pair of headphones and I use them for everything. Now that we’ve touched on the basics of the equipment, I’d like to turn now to preparations that need to be made before the show starts. Eliminate any sources of noise in the room or vicinity. Turn off your cell phone, unplug your land line, turn off any air conditioning or fans you may have, etc. If you have pets, especially loud ones, try to take steps to avoid them making noise that will be picked up on the recording. If your chair creaks, find one that doesn’t (or stand). Quit all unnecessary programs on your computer. To do the podcast, you only need Skype and QuickTime. Be sure to turn off Dropbox and other bandwidth-sucking programs that may be running in the menu bar or background. If you can, turn off wi-fi and plug into your network with ethernet instead. If you have other machines or live with other people, make sure that they’re not using much, if any bandwidth during the call. 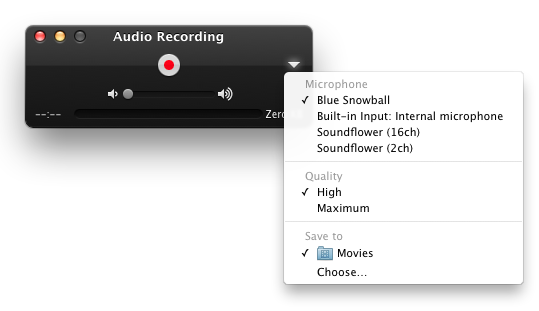 Although it’s not necessary to have a lot of bandwidth available as the recording is done locally, it helps Skype avoid quality reductions and dropouts. Level your audio. 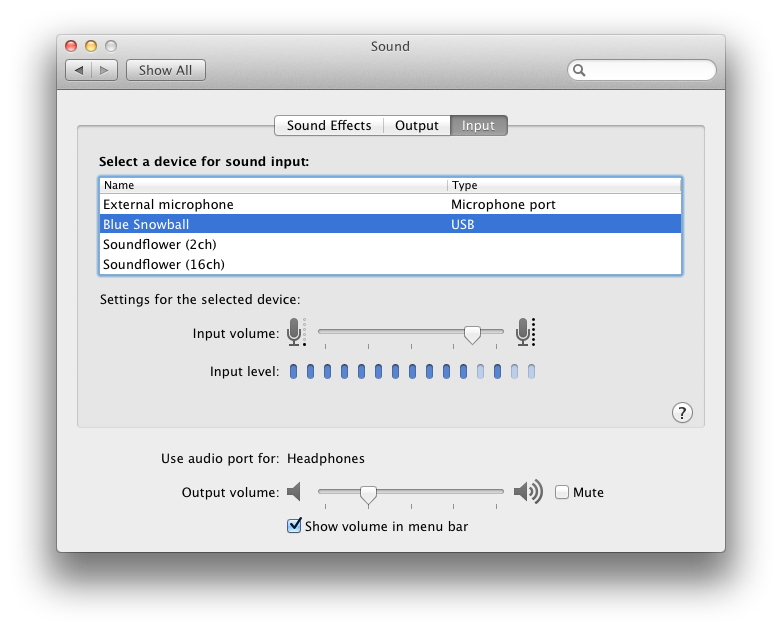 Open System Preferences and go into Sound. Under “Input”, select your microphone and speak into it as if you were speaking on the podcast. You will notice that the input level jumps around as you speak. You should adjust your input volume so that at your loudest you’re about 80-90% of the max of the input level indicator. It’s very important that during the recording that you never max your audio level – this results in what called clipping and produces very noticeable distortions. When testing, you may feel a bit silly talking to yourself and hold back on your how loudly you speak – this is a recipe for setting your volume too high and continually clipping once the actual conversation is underway. The values under Microphone will be based on the input devices available to your computer. Select the input device that corresponds to the microphone you are using for the show. Also, ensure that the Quality setting is on High. Although Maximum sounds like it’s better than High, it produces enormous file sizes that are difficult to send over the internet. So please make sure High is selected. Take note of the Save to location; this is where the audio file will be saved. The default for Mac OS X is Movies, which is the Movies folder in your home folder. You may save the file anywhere you like so long as you are able to retrieve it after the show. We use a Skype audio conference call to connect all the participants of the conversation. If you haven’t already done so, please email us at podcast@askdifferent.net with your Skype username so we will have it in time for the show. To make the audio syncing a little easier, we all try to start our recordings at the same time, so shortly after the call is connected and we do a bit of introduction and we’ll count down to start the recording. The show then follows for the next hour or so. We will invite you to a Dropbox shared folder. Just restart Dropbox, put your local recording in the folder, and you’re good to go! Barring any unforeseen circumstances, the show will be published the following Monday. Once again, thanks for being on the show!